It was the first day of my much-anticipated African safari. Riaan, my Professional Hunter met me at the Land Rover at first light. We would be accompanied on the hunt by Freddie, the apprentice PH who would also serve as our driver; Dave, a personal friend of Riaan’s and a local Wildlife Conservation Officer; Daniel, the native tracker; and Lucas, a native tracker and skinner. It was cool in the early morning dawn, but I was filled with excitement and nervous energy. I couldn’t wait to start hunting. With my rifle safely in the gun rack, we were finally underway. As we entered the Bushveld, Freddie slowed the Land Rover and all eyes intently gazed into the thickets ahead. It wasn’t long before we were spotting animals. A flash of two young Waterbuck bulls in the marsh to our left. A herd of Sable passing several hundred yards in front of us. To say that I was absolutely enthralled with these wonderful creatures would be an understatement. At each sighting, Riaan would quickly raise his binoculars, and just as quickly lower them once again, and motion for Freddie to continue on. These were either not the animals we were after, or didn’t measure up to Riaan’s standards. Throughout the day, we continued to spot several groups of animals, but again, not what we were searching for. In my mind, this is what makes hunting in Africa so unique and appealing. You spot a tremendous number of animals, and you see species that are totally different from what we are accustomed to on the North American continent. There is intrigue and excitement around virtually every corner. After a relaxing and enjoyable lunch we continued on, and again it wasn't long before we were glassing more animals. Zebra, Blesbok, Red Hartebeest, and Impala just to name a few, seemed to appear at every turn or rise in the road. Suddenly, Daniel motioned to the right. He had seen something! Riaan promptly told me that they had spotted a group of Gemsbok with what appeared to be a couple of good bulls. Dismounting the Land Rover, we were quickly in pursuit. We hadn’t gone far, when Riaan suddenly motioned for me to stop. To our right was a herd of Eland, bedded in the shade of the Mopane trees. They hadn’t yet spotted us, but if we continued on our course, they would certainly bolt, taking the Gemsbok with them. Riaan briefly surveyed the situation. We had two choices. We could either retreat, and circle far to our left, and out of sight of the wary Eland, or we could attempt to crawl past them. Fearful that the first plan would take too long, and we would lose the herd of Gemsbok, Riaan decided to go with the second option. We slowly dropped to our bellies, and bit-by-bit moved quietly past the resting herd. The hard packed sand was hot and abrasive, but I was too focused on the herd of Eland to feel the pain. We crawled for nearly 600 yards, and what seemed an eternity, but finally we were out of sight. Once we were back on our feet, it took a few minutes to completely straighten up, and allow the kinks to subside from my tense muscles. I could now feel the burn of the abrasions on my elbows and knees. We were once again in pursuit, but the Gemsbok had put a considerable distance between us. Undaunted, we continued the chase. "There's an Impala you want to shoot!" His words immediately brought me back to reality. A very large ram, with tall lyre shaped horns, was feeding a few hundred yards away. Within seconds however, he was obstructed by a large mopane tree approximately 75 yards in front of us as he continued moving to our left. The light was beginning to fade, and we needed to make our move. It was now or never. We crouched as low as possible, and quickly made our way to the mopane tree. As I searched for a limb to use as a rest, and an opening to shoot through, Riaan kept his binoculars fixed on our prize. I finally had what felt to be a steady rest, but only a very small opening to shoot through the dense foliage. As I found the Impala in my scope I was frustrated to find that he had now fed behind some brush, obscuring his vitals. The light was quickly fading along with my optimism. Suddenly, he was moving forward again, but as he stepped from behind the brush, two female Impala stepped alongside him and stopped. Once again, no shot opportunity. Each time the two females moved forward, he followed, and between the two of them, they unknowingly kept him protected. They stopped. He stopped. They moved. He moved. I began to panic, thinking that this Impala of a lifetime would soon escape into the darkness. All of a sudden, the lead female moved forward slightly. He, and the other female stayed put. This was the chance I had been waiting for. Only his front shoulder was exposed, but enough so that I was sure there was no chance of hitting any of the other animals. I quickly found his reddish brown shoulder, steadied the crosshairs, and squeezed. I barely heard the roar of my 300 Win. Mag., but vividly saw the orange blast from the muzzle, as the burning powder was bright in the dim light and shade of the tree. Impala were running everywhere, but where was he? Did I miss? What the hell happened? Out of the blue, a huge slap on the back. "You got him, he’s down. Good shooting." As Riaan congratulated me, the reality of the moment, and the excitement were nearly overwhelming. We moved forward in the now encroaching twilight, and there he was. What a magnificent and beautiful creature. Finally, after years of dreaming, countless hours of planning and waiting, days of traveling, and the exciting but exhausting stalk, I had my first African trophy. And what a trophy he was. I later learned that he would be number 23 in the SCI record book. What an incredible start to a fabulous 14-day safari. It only seemed appropriate that my first trophy is also perhaps the epitome of South African Plains game. The sleek, graceful, and athletic Impala. It couldn’t have played out any better. As darkness descended upon us, we talked of the days events as we waited for Freddie and the Land Rover. Once back at the lodge, the first stop was the skinning shed, where we continued to marvel at this magnificent creature. Later that evening, it was fried Impala oysters and wine in celebration of our success. What a wonderful adventure it had been. As I lay on my bed, exhausted from the long day now behind me, I reflected on all the wonderous sights I had seen, and the friends I had made. It truly doesn’t get any better than this. I can’t wait to see what tomorrow brings! In the end, I added 3 more gold medal animals, including a huge Waterbuck, a Blesbok, and Black Wildebeest, 2 silver medal animals including a Common Mountain Reedbuck and Springbuck, and last but certainly not least, a beautiful Gemsbok. This adventure was truly the hunt of a lifetime, a dream come true. I can’t wait to do it again. Africa is a mystical and magical place. I will be back! Comments for There's an Impala you want to shoot! There is just something unique about the Impala! I spent 7 years cahsing after my first Impala... 7 years! But, it was worth every moment of agony. A good description of a good hunt. Very straight forward. Thank you for sharing your exciting highly detailed story. I can only say that you must have been hunting in a Zoo with all the animals around (just kidding!). What a game-rich environment!! Great story. As I read it, I was able to imagine what it must have been like to be stalking one group of animals, only to encounter other species along the way, and the excitement level you must have felt. Truly makes me want to go on a safari tomorrow! Very well written, with nice detail. Thank you for the wonderfully detailed story. 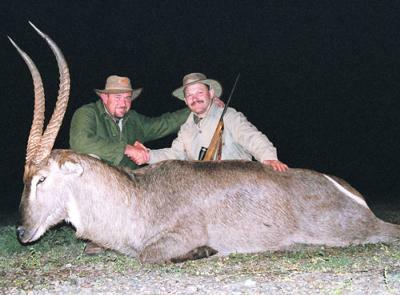 I can only imagine what a hunt like that was for your first African trophy. I would like to Safari to Africa also.